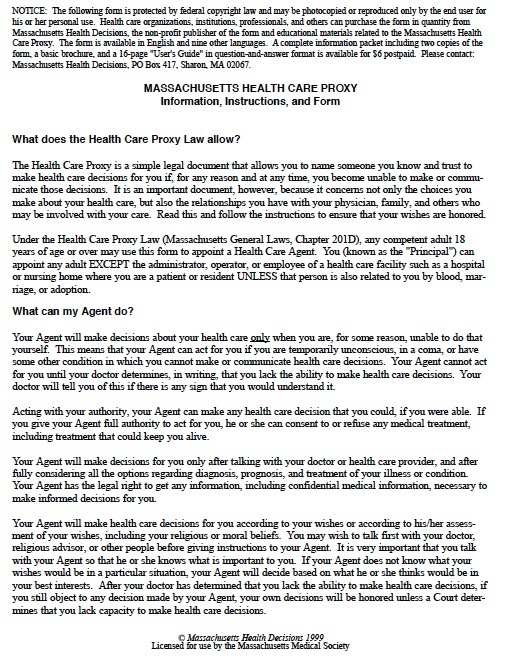 Otherwise known as a “Health Care Proxy”, informed consent is an important aspect of medical treatment. Sometimes, however, patients become incapacitated and unable to tell doctors whether to continue with a particular treatment, for example, if they suffer a serious brain injury or advanced dementia. By completing an advance healthcare directive, you can name an agent to make healthcare decisions for you and specify whether you would want certain treatments like life-support if you had a terminal condition. If your doctor determines that you cannot make treatment decisions, the agent can act on your behalf regarding nearly any type of treatment, procedure, and surgery, and the agent can decide which healthcare personnel to hire and which facilities to use. The agent can explain to physicians why you would want or not want a particular treatment based on your values and goals. Living wills (included in the Advance Directive) are not binding under Massachusetts law, meaning hospitals do not have to follow their instructions. But creating one would still provide guidance to your agent and doctors as to whether to continue life-sustaining treatments if you have a terminal condition.